Place Vendôme (Eau de Toilette) is a popular perfume by Boucheron for women and was released in 2013. The scent is floral-fresh. It is being marketed by Inter Parfums. Yuzu always makes me fall in love at first sniff with a perfume. Osmanthus, on the other hand, as much as I appreciate the natural smell, is a tricky note in perfumes for me, like freesia. So, it wasn't perhaps really surprising that my affair with Boucheron Place Vendome EDT remained a short one: Fell in love with the slightly sugar-coated yuzu opening, the floral bouquet très chic and very French, so dreamily romantic and delicate--not only peony and rose, but jasmine and osmanthus altogether seem to have been gently dusted with a rose-coloured powder. A more eloquent person would paint the imagery this perfume evokes in richer words than myself, so I will not attempt further. For a while, I was floating on the luminous, rosy cloud of sweet powder--and fell down when the musk began to grow larger and larger, covering the light and taking out the air, heavily laden with the powdery sweetness now threatening to cause headaches. And of course, osmanthus had emerged, adding a high-pitched tone to the overall fizziness in the base which I suspect to be Iso E Super, judging from its nose-tickling quality. 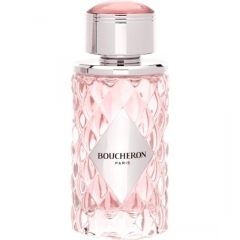 It is categorised as "a woody citrus floral" on the Boucheron website, and I seem not to be the only one being reminded of Light Blue, also because of the basenote. It remains a very chic and feminine fragrance, like a pair of intricate silver studs with rose quartz, requiring a certain fashion and occasion to be worn with; whatever the base components are, they lend this perfume a very bright 'fizz' and effervescence despite its warm and earthy powderiness, making this an adequate choice for young ladies who wish to smell mature and elegant and yet, retain a certain youthfulness*. Write the first Review for Place Vendôme (Eau de Toilette)!